The CDC announces the discovery of a new virus. The Centers for Disease Control and Prevention (CDC) is reporting on the discovery of a new virus that may have contributed to the death of a previously healthy man in eastern Kansas in late spring 2014. A CDC study published details the progression of the man’s illness and actions taken by CDC, the Kansas Department of Health and Environment (KDHE), and University of Kansas Medical Center (UKMC) to treat and investigate the case. The opensource study is published in the journal Emerging Infectious Diseases. According to reports, the patient, who was over 50 years old, was working outside on his property in late spring 2014 when he received several tick bites and found an engorged tick on his shoulder. Several days later, he fell ill with nausea, weakness and diarrhea. The next day, he developed a fever, anorexia, chills, headache, myalgia, and arthralgia. The patient visited his primary care physician on the third day, at which point he was prescribed an antibiotic for a presumed tickborne illness. The next morning, his wife found him experiencing reduced consciousness and we was taken to the local hospital. After test results for many infectious diseases came back negative, a sample of the patient’s blood was sent to CDC for additional testing. Initial CDC testing showed evidence of an unidentified virus in the sample. CDC researchers then used Advanced Molecular Detection (AMD) and determined that it was a new virus. The virus, named Bourbon virus for the county where the patient lived, is part of a group of viruses called thogotoviruses. This is the first time a virus in this group has been shown to cause human illness in the United States and only the eighth known case of thogotoviruses causing symptoms in people. Since viruses in this group (thogotoviruses) have been linked to ticks or mosquitoes in parts of Europe, Asia, and Africa, Bourbon virus might also be spread through tick or other insect bites. CDC is collaborating with KDHE and UKMC to identify additional cases of Bourbon virus disease, determine who gets sick and with what symptoms, and how people are getting infected. CDC experts will also be working in the lab to better understand the virus itself, how it makes people sick, and what animals (if any) may play a role in its spread. This information will help determine the best ways to potentially prevent and control Bourbon virus. The discovery of Bourbon virus, as well as the recent discoveries of Heartland virus in Missouri and severe fever with thrombocytopenia syndrome viruses in China, leads CDC researchers to believe that other undiscovered viruses are likely causing people to get sick. Use of AMD methods in laboratories across the world is an important tool for discovering and addressing new pathogens. The CDC has published emergency information for medical teams on the bourbon virus which can be found here. Electron microscopic images of novel Thogotovirus isolate. Filamentous (A) and spherical (B) virus particles with distinct surface projection are visible in culture supernatant that was fixed in 2.5% paraformaldehyde. Thin-section specimens (C and D), fixed in 2.5% glutaraldehyde, show numerous extracellular virions with slices through strands of viral nucleocapsids. Arrows indicate virus particles that have been endocytosed. Scale bars indicate 100 nm. 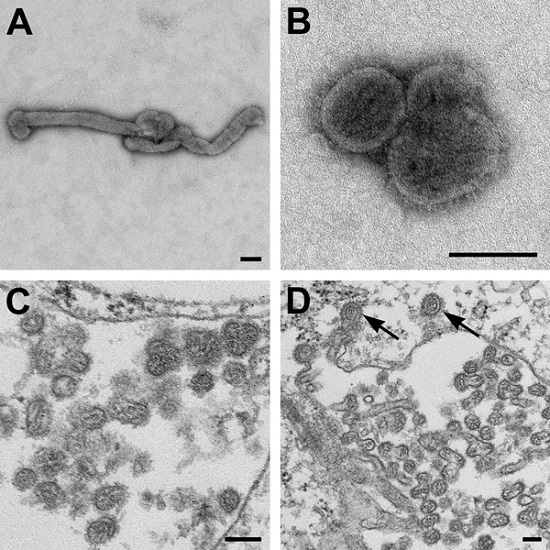 Novel Thogotovirus Species Associated with Febrile Illness and Death, United States, 2014. Staples et al 2015.